Psoriasis Skin Disease is characterized by patches of red scaly skin often covered by silvery scales of dry, dead skin. It is a persistent skin disease that defies understanding. It is difficult to predict where it may appear because too little is known of its cause. Psoriasis comes in different forms and an individual generally has only one form at a time. However, when the lesions from one type heal, another type of Psoriasis may form. Fortunately, psoriasis does not permanently damage the skin because it doesn’t leave scars. There are known triggers for psoriasis including infections that might otherwise be asymptomatic. The appearance of psoriasis can indicate the presence of an infection. Psoriasis is often associated with a compromised immune system. Skin cells sometimes multiply rapidly in patches on the body, even up to ten times their normal rate. This causes a rash as the excess cells rise to the surface and die. It happens most commonly on the knees, scalp, lower back, face and elbows, but can occur anywhere on the torso as well as on the soles of the feet and palms of the hands. 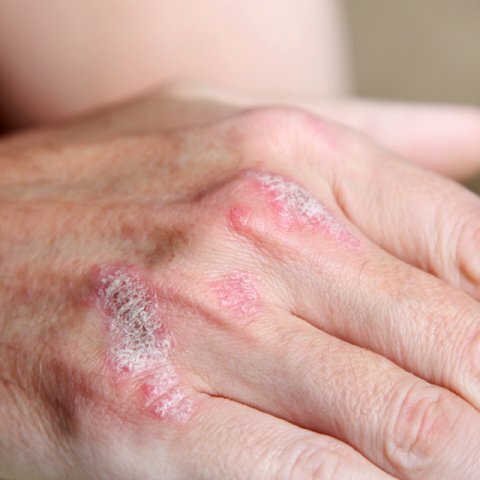 This is the most common form of Psoriasis Skin Disease. Plaque psoriasis is characterized by raised lesions that tend to be painful. They itch, crack and bleed. Small, scattered patches can grow, merging with other patches to create a large area of afflicted skin. The patches have well defined edges and don’t respond to over-the-counter medication. They are easy to feel because of the excess of skin tissue. Inverse Psoriasis is found in body folds. Its bright red lesions appear under the arms, breasts, in the groin area, or in other body folds where rubbing may cause irritation. It is common in obese people with deep skin folds. Inverse psoriasis rashes are not as raised as other psoriasis lesions because the environment it appears in is typically moist. Guttate is the second most common form of Psoriasis Skin Disease. Guttate is characterized by small, red spots that number in the hundreds and typically appear on the trunk and limbs but have been found on the head, as well. Guttate can be present with other forms of psoriasis or can precede their appearance. Psoriasis Skin Disease is unsightly and even painful, but possibly the worst symptom, Psoriatic Arthritis, occurs in more than a third of its victims. This form of arthritis appears in about 30% of sufferers of psoriasis, and can be extremely painful and debilitating. Pustular Psoriasis is characterized by raised pustules filled with pus. The pus is not infectious; it is made up of white blood cells. This is generally only an adult form of psoriasis, though when it does appear in a child they usually have an easier course. Von Zumbush, which is a dangerous form that requires immediate medical care because it can be deadly. It appears first as a reddened patch of skin, but within a day or two becomes pustules. When the pustules dry the skin appears smooth and shiny. Palmoplantar Pustulosis (PPP) appears on the palms of the hands and soles of the feet. Studded, reddened plaques become studded, then turn brown and peel before crusting over. Acropustulosis is a rare, painful form of psoriasis. Lesions appear on the tips of fingers or toes. When they become severe enough they can cause changes to the bones. Psoriasis Skin Disease affects approximately 7.5 million Americans and is the most common skin disease in the country. There are treatment options that can ease symptoms and make life with psoriasis easier, and, when possible, careful avoidance of triggers can reduce outbreaks. It is not contagious, but it can be painful and sometimes lead to permanent disabilities.